Our beautiful and elegant decorated 1-Bedroom-Apartment in Palm Mar, South-Tenerife consist of a fully fitted and well equipped kitchen with breakfast bar, a large lounge with double couch bed, a well appointed bedroom with Kingsizebed and ceiling fan, Balcony, elegant bathroom with walkin shower and Jacuzzi-bathtub, Highspeed Internet WIFI and a large, seafacing terrace. Here you can see the sunset, to the sea and La Gomera. Located on the top of the complex building is a quiet, tranquil swimming pool and sunbathing terrace, offering the most stunning sea views. Ideal for couples and families looking for a relaxing getaway. From the big flatscreen TV in the Salon you can watch all European Programs included UK, German, Holland, Italy, Spanish, etc. This spacious Appartment is 90qm and all rooms and Terrace do have Ceilingfans. Marble floors throughout. Smoking on the Terrace only please. A private underground parkingspace is also for your use. The beachwalk and the beach is just 3 minutes away. 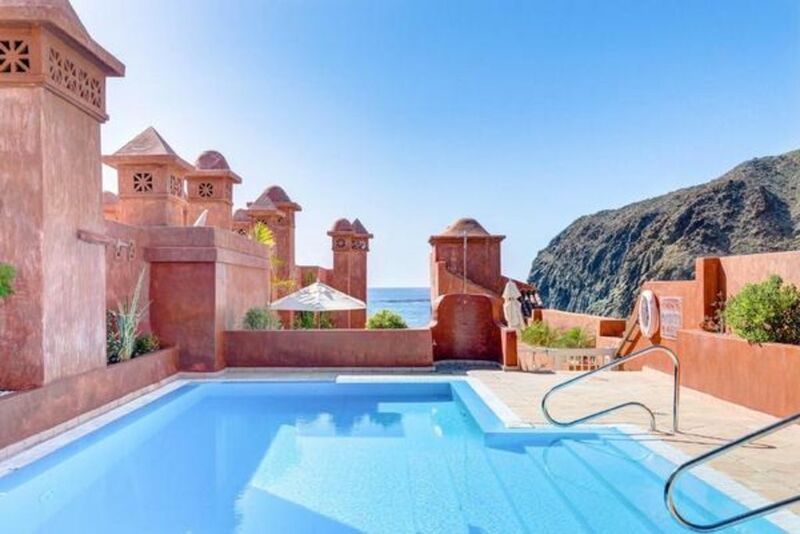 Palm Mar is situated just about 10 minutes from Los Cristianos and Costa Adeje and 15 minutes from the Airport Tenerife Sur Reina Sofia. In Palm Mar you will find all you need for your holiday: a supermarket is on the next building from your apartment, as is a bar that serves breakfast, lunch and dinner. On the beachwalk there is a brand new beach restaurant with entertainment, good food and nice atmosphere. For people who love it like rustic and original, there is a Chiringuito right on the beach, with a full bar and best sunset watching. Also in the area there is a good variety of different bars, restaurants and shops, a gym and other activities. Palm Mar is a beautiful residential area. It is a excellent place for hiking, walking, riding a bike and enjoying the outdoors. It is surrounded by mountains and protected natural area where you can see all kinds of plants and animals. Pet: once per pet Costs amounting to 50 EUR (Mandatory).